The Clove Plant | Possible to Grow if You Have a Lot of Space and Warmth! This potent spice is the unopened bud of the evergreen clove plant -- some call it a clove tree --, and was originally found growing on only a few of the Maluku Islands (Spice Islands) of Indonesia. Today, they are cultivated and harvested all around the world. The main countries are in Indonesia, Pakistan, India, Sri Lanka and several countries in Eastern Africa. The plant has square leaves, and flowers that grow in small clusters. These flower buds are the fragrant clove spice. Originally pale pink in colour, the flowers are harvested when they are about two centimetres long and turn bright red. Then they are sun dried outside until they are a dark brown colour, and are as hard as, well, nails. 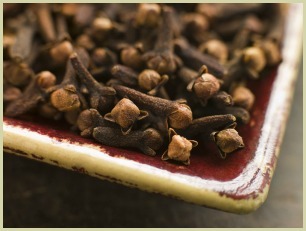 Arab dealers traded in whole cloves during the middle ages throughout the Indian Ocean trade routes. In the fifteenth century the Portugese took control of these routes. At this time they were one of the most expensive and prized spices in the world. ...that European spice traders were desperate to grow it in a more accessible and cheaper fashion. And it was the French who succeeded in growing it in Mauritius in the 18th century. After that success, other countries were able to cultivate clove trees in Brazil, Zanzibar and the West Indies. Click for further info. Thinking About Growing a Clove Plant? ...you may want to note that you need to have enough space, as the plant can get quite big, and can reach eight to twelve metres tall (26-40 feet), by eight metres wide (26 feet). Of course not everyone has the space or inclination to grow their own, but you can still benefit from having the lovely and versatile ingredient on hand in your kitchen. Whole and ground cloves can be used in a whole range of dishes, from Indian curry to Mexican tacos to Vietnamese soups, and are used in both savoury and sweet recipes. You can even make a potent cup of clove tea! Read more about the uses.